Very comfortable. Fabulous staff! Excellent location. Where to find Halfmoon Bay hotels near an airport? Where can I find hotels in Halfmoon Bay that are near tourist attractions? 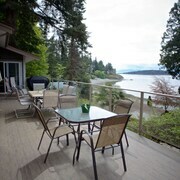 Hoping to find accommodation in Sunshine Coast, particularly in or near Halfmoon Bay? You'll find 3 Expedia-listed apartments and hotels within a 0.1-kilometre (0.06-mile) radius of the heart of town. 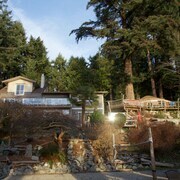 Within easy driving distance of Halfmoon Bay, are the Rockwater Secret Cove Resort and InnSpire Resort. 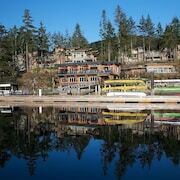 14 kilometres (9 miles) from the center of Halfmoon Bay, is the Painted Boat Resort. Alternatively, the Cozy Court Motel is positioned 12 kilometres (8 miles) away. 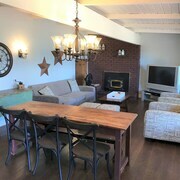 You could also choose to make a booking at the The Tuwanek Hotel and Spa or the Above The Inlet B&B and Vacation Rental. Gibsons is 30 kilometres (19 miles) to the east of Halfmoon Bay and is home to the Sunshine Coast Museum and Archives and Langdale Ferry Terminal. Expedia-listed Gibsons hotel options include the Sunnycrest Motel and Cedars Inn Hotel & Convention Center. 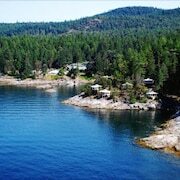 Alternatively, you could stay in Sechelt, 11 kilometres (7 miles) to the east of Halfmoon Bay, where you can pick from the Sechelt Inlet B&B and Tranquility Bay Waterfront Inn. 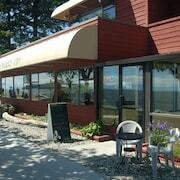 The House of Hewhiwus and Sechelt Visitor Centre are a couple of the popular points of interest to see while in Sechelt. If enjoying sport is a favourite pastime, take the time to visit BC Place Stadium, which is 65 kilometres (40 miles) to the southeast of Halfmoon Bay. For tourists who are interested in booking accommodation nearby, make a reservation in the Fairmont Pacific Rim or Shangri-La Hotel, Vancouver. 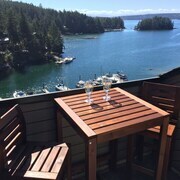 If you are flying into or out of Pender Harbour Waterdrome Airport and plan to stay nearby try Enchanter Oceanview Suites or Chateau Cedro Rosso. What are the most popular Halfmoon Bay hotels? Are there hotels in other cities near Halfmoon Bay? 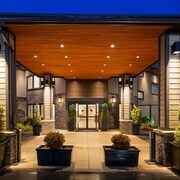 What other types of accommodations are available in Halfmoon Bay? Explore Halfmoon Bay with Expedia.ca’s Travel Guides to find the best flights, cars, holiday packages and more! Fairmont Washington, D.C., Georgetown in Washington D.C.